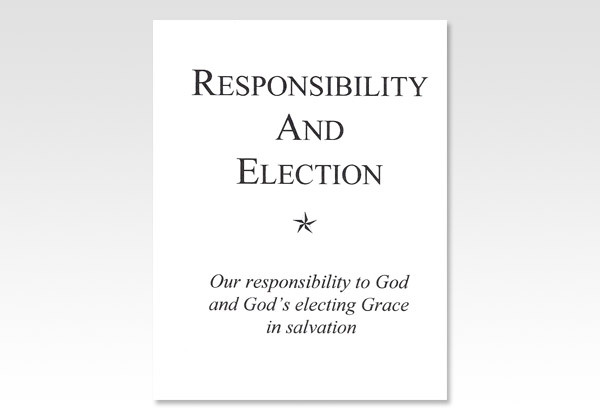 Responsibility and election are two lines of truth which run side by side in the Word of God. To our natural minds it may seem that one is not in accord with the other, but we must remember that we are finite in our understanding while God is infinite. Our minds are at peace in these matters when we bow to God's revelation and accept the truth of His Word. In Isaiah 55:8,9, we read, "For My thoughts are not your thoughts, neither are your ways My ways, saith the Lord. For as the heavens are higher than the earth, so are My ways higher than your ways, and My thoughts than your thoughts." With the Lord's help may we seek to learn about God's thoughts and ways as revealed in His Word, and we will see how consistent they are, for as Proverbs 8:9 says, "They are all plain to him that understandeth, and right to them that find knowledge."